I want to break up all these holiday eating posts with something a little more local. Croydon! In particular, Brasserie Vacherin in Croydon, one of our locals; it’s run by Malcolm John who also runs our beloved Le Vacherin in Chiswick. We’re often there for dinner and occasionally for breakfast but recently we stopped in for their relatively new weekend brunch menu. And it’s a cracker! Two courses for £12.95 or three for £17.50 and it includes bottomless Virgin Marys! Last weekend we started with a red wine poached pear, blue cheese, walnut, and endive salad for Blai (his favourite and we never have blue cheese at home as I’m not a fan and I do most of the food shopping!) 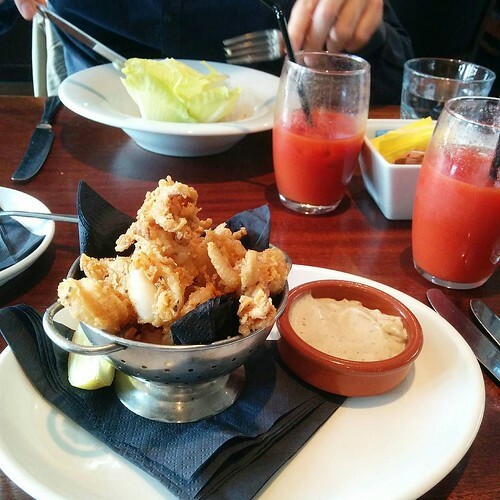 and crispy fried squid with roast garlic aioli for me. We shared our main courses: a roast beef lunch (Sundays only) and fried eggs with chorizo and avocado and bacon. 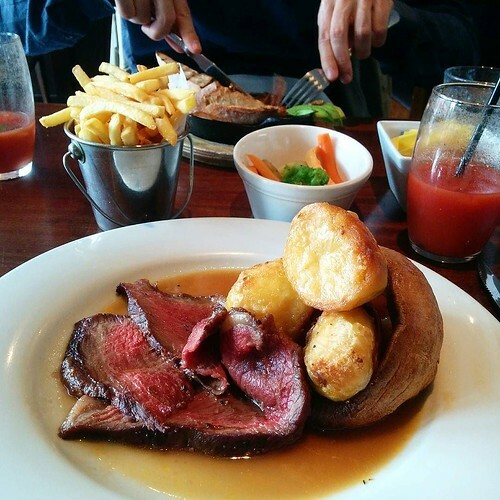 The roast was alright, just needing a little more seasoning – best not to take my word for it though, as I’m not the biggest fan of Sunday roasts. I’m not sure what compelled me to order it; I always feel like one about once a year. The eggs definitely felt more brunchy and the bacon was a standout. By this point, we were very full! But I wanted dessert (greedy!) 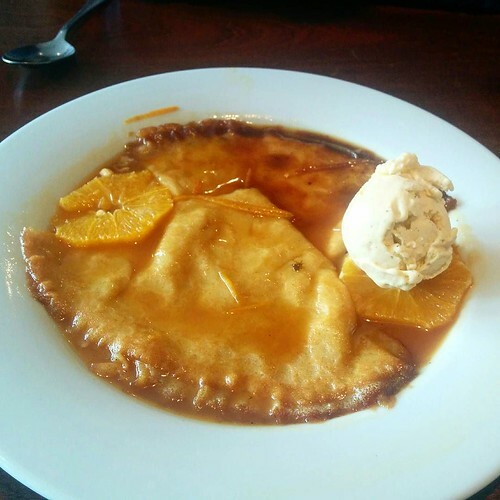 and so we split a single crepe Suzette. Only it turned out to be crepes plural and the whole lot turned up on a dinner plate. It was huge! It was delicious. It’s a brilliant deal and the food is all excellent. There are more traditional brunch options on the menu like eggs benedict or baked eggs or other more lunch items like a burger and fish and chips; we’ve tried almost all of these and so can vouch for them all. There’s something for everyone and I love it. Thank goodness it’s a local of ours! I’m not entirely sure why we’d not yet been to Karnavar on South End, Croydon’s restaurant street. It’s a more upmarket Indian restaurant and I think we were going to save it for a special occasion. Well, that is, until I discovered they have a spectacular deal for Sunday brunch – five courses for £25, or £40 if you want a champagne brunch, for a massive Indian style roast brunch. The menu is an Indian twist on the Sunday roast lunch but also features classics from their usual a la carte menu, making it a good first visit. 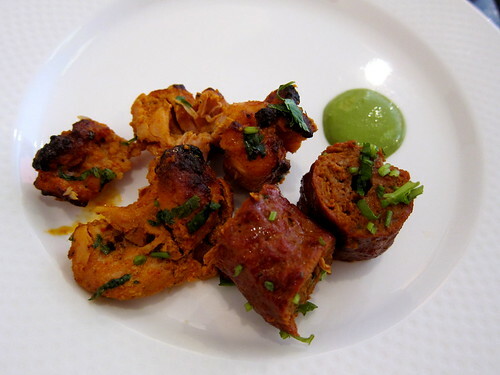 We went one recent Sunday when we felt yes, brunch and yes, Indian food, and loved it. Here we go. Five courses. Course 1: Chef Live Cooking Station. The station was placed at one end of the starter table (photo above). From here, you could place an order (or lots of orders) for freshly made dosas, oothapams, Indian omelettes, or Indian scrambled eggs. 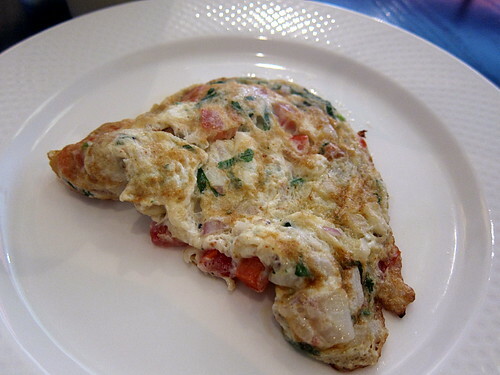 We shared a plain dosa (made small, just the right size for a buffet) and a beautifully made Indian omelette. We only realised after our meal that the chef manning this station was the chef-owner – he was just the friendliest! Course 2: The Starter Table. On the table by the window, there was a good spread of various dishes from which to help yourself. 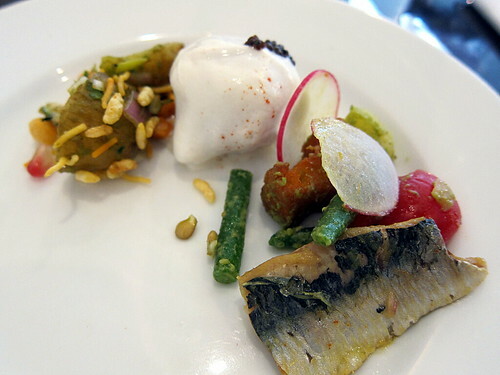 My particular highlights were the Roasted Dokla with Home Cured Sardines and Potato Salad, the fantastic Karnavar Special Golden and Candy Beetroot Chaat with Goji Berry and Moong Bean Sprout, and the Dahi Wada (Black Gram Dumplings with Yogurt, Mustard and Cumin). Take your time over them… it’s a leisurely brunch and you’re welcome to graze for as long as you like. This course was brought to your table by a waiter wielding a massive frying pan full of Tulsi Seekh Kebab and Chicken Tikka. Both were very spicy and flavourful and I probably could have put away a lot more if I hadn’t been worrying about what and how much was coming next. There was also a separate pan full of Salmon Pakora with Sweet Curry, Capers and Gherkin Sauce. 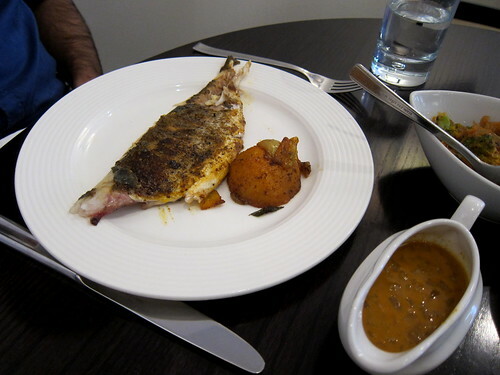 This I loved, definitely putting away a few more than necessary – that sauce was like a fantastic Indian tartar sauce. Then it was time for mains. Each diner gets to choose one of the mains from the list but they can have as much of that protein as desired. My Roasted Pork Belly Coorg/Kerala style served with Mappas Sauce was fine but Blai’s Sea Bass Polichathu, Kerala Coastal style served with Mappas Sauce was finer. I think I had been hoping that the pork belly was spiced itself but most of the Indian flavour was from the onion sauce served alongside. Blai’s fish was exactly as I’d hoped for, all dusted with spice. It’s not a roast dinner though without all the sides! Garlic and fennel seed spiced roast potatoes were tender and delicious. Vegetables were an addictive Cauliflower thoran (addictive), an excellent Chef’s seasonal vegetables, which that day was Broccoli do pyaza, and my typical Indian meal must-have, Panchmel dal (think tarka dal). Carbs were a Saffron pulao rice and Butter naan (very buttery!). Like the mains, you could get more of the sides you desired. You can imagine how stuffed we were by the end of this course! 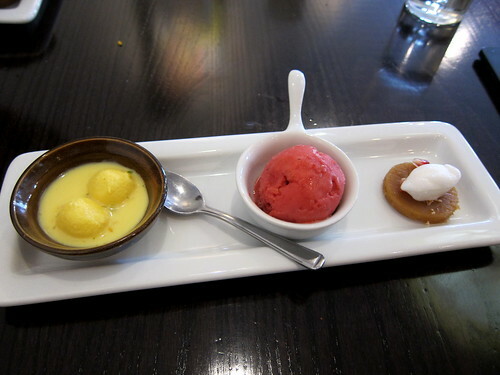 Dessert was a tasting plate of (from left to right) Rasamalai (Indian Milk Cheese Dumplings with Pistachio), raspberry sorbet, and Kinnathapan Malabar (Rice and Coconut Pudding with Lemon Sorbet). I do believe this is the only course you cannot repeat but the little sweet bites were the perfect size after we’d stuffed ourselves from the previous four courses. 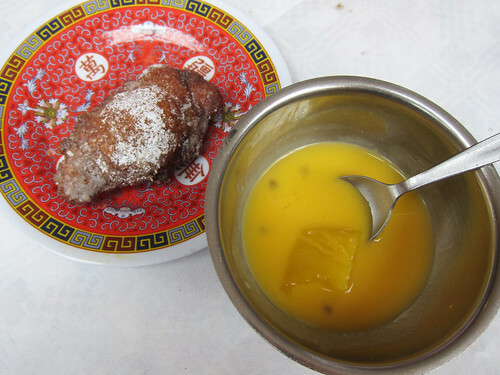 Actually, no, I’d be lying if I said I didn’t want another of the amazing rasamalai, some of the best I’d ever had. 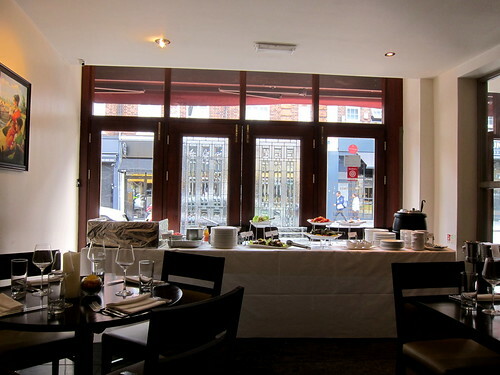 Bookings are essential for Sunday brunch (it’s very popular) and can be made via their website. What I noticed was that the food was highly spiced and flavourful but not chilli-hot, making it perfect for families, and there were a lot of families that Sunday. Needless to say, go hungry! Oh, and if you’re a vegetarian or dining with vegetarian, there are vegetarian options for the more meaty courses (vegetarian but not vegan). Sometime in the past year, I was saying to Blai, “You know what? If only we had some good Thai food and some good Neapolitan pizza, we’d be sorted here in Croydon.” Well, there’s good pizza at our brilliant neighbourhood Italian joint Bagatti’s but that’s not Neapolitan and there’s excellent Neapolitan pizza in neighbouring Beckenham but that’s not nearby. But then, out of seemingly nowhere two weeks ago, one shopfront on South End in Croydon opened up with a massive wood fired oven by the window and a sign: Pizzeria Pellone. What was this?! And I could’ve sworn there was nothing there in the first place – it was like a miraculous appearing house (sort of like that one in the Harry Potter books). A quick Google search found a Pizzeria Pellone in Herne Hill and this was to be their second branch. My hopes were high and not long after they opened, I dragged Blai and another friend there for an early Saturday dinner. 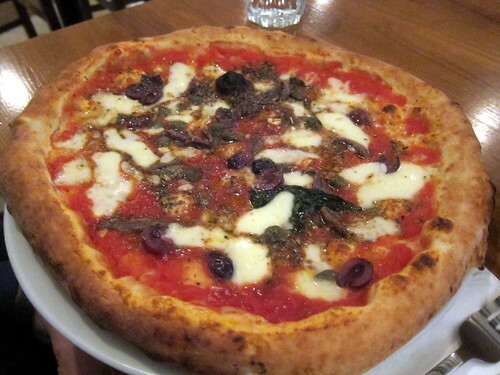 We were ushered to a table near the oven, a welcome warm spot and where we could watch the pizza chef do his thing. We originally thought of getting some starters but in the end went straight to mains, and we’re glad we went down this route. 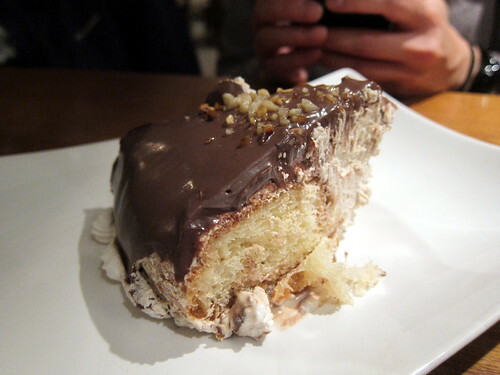 Blai’s Napoletana was splendid… and huge! These pizzas were a good size but, of course, we’re not complaining. 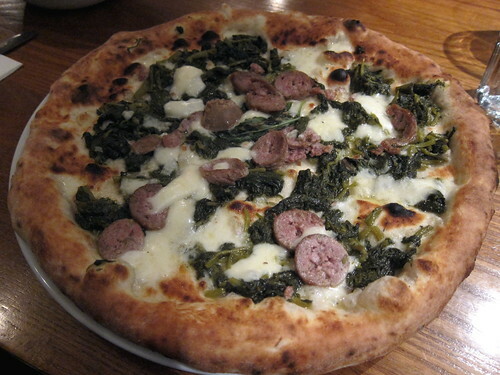 My Salsiccia Friarielli was generously topped with the bitter Neapolitan greens. Our pizzas were both fantastic – good crusts, generous toppings, big enough to share. 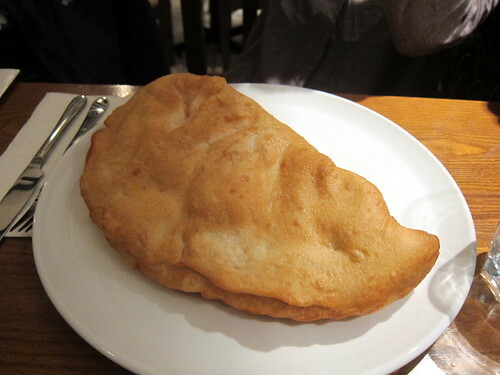 My friend’s Calzone Fritto, filled with fior di latte cheese, ricotta, tomato, and salami, was impressively non-greasy. This is their signature pizza and their only fried offering. I’m glad to have tried it but I’m going to be more loyal to the pizzas coming out of their wood-fired oven. But now that I think about it, they have a deep fryer. 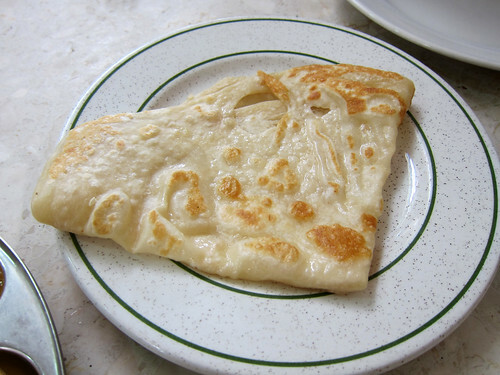 They could have little fried bits like they do in Naples – the bits that you munch on while waiting for your pizza. I’m just sayin’. 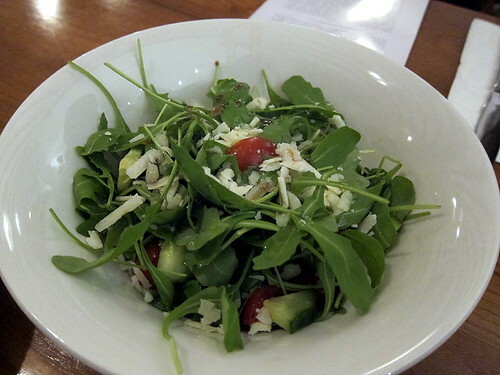 There were some greens too – a pleasant rocket salad. 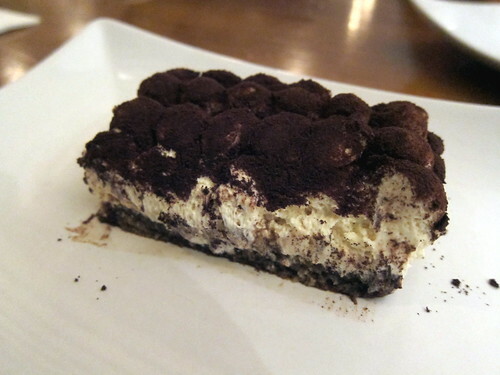 A couple of bought-in, but excellent, desserts (tiramisu and a chocolate coated babà – the latter was well boozy) rounded off our meal. It’s a shame they’re not homemade but hey, it’s all about the pizza here. Our bill for the three of us came to about £35 in total and it even came with a complimentary limoncello each! In the last couple of weeks, the place looks like it’s getting popular and I hope it goes down well with Croydoners. Service can be a bit sluggish but that seems down to the fact that all the waitstaff were new – I hope this improves. Finally, pizza Napolitana in Croydon! 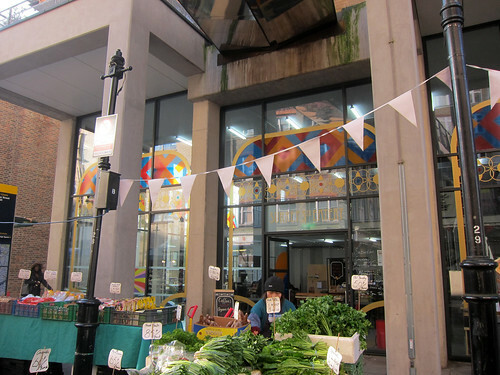 Croydon Council and the Greater London Authority, along with the Portas Town Team, have opened Surrey StrEatery on, you guessed it, Surrey Street, a market street that’s existed in some form or other since the 13th century. 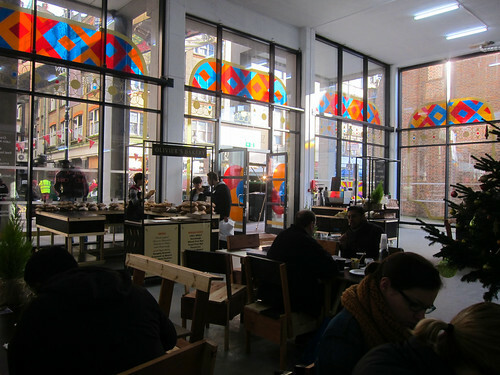 It’s kind of like a food court, but with indoor street food stalls. 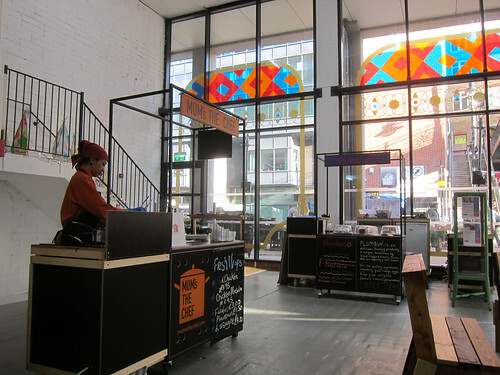 Seven street food stalls were invited/accepted to open in the building for half a year and there are also events and a good overall sense of community there. The seven stalls get promotion for the 26 weeks as well as general business support; I think it’s a brilliant idea to help out new local small businesses! 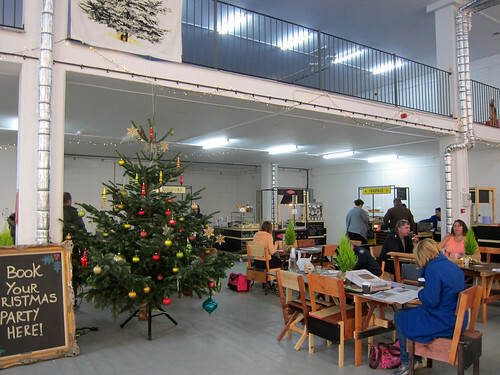 When I visited earlier this month, Christmas was in full swing at the StrEatery, with food hampers filled with goods from the stalls available for gifting. It was warm inside and it was welcoming; every stall radiated smiles. I grabbed a flat white from Ro Co (excellent) and perused the rest of the stalls. 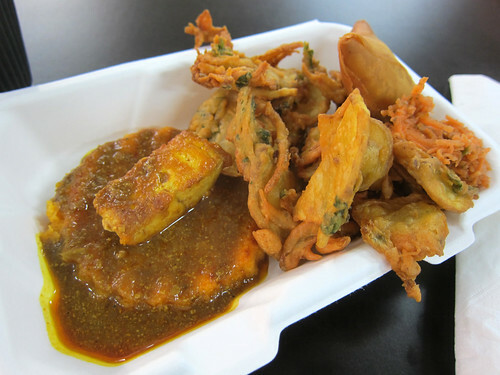 That day, I opted for a bit of Goan food – for £5.50, I received a plate with Goan fish curry on a soft steamed rice cake, freshly fried vegetable bhajis, a lamb samosa and a bit of homemade carrot pickle. It was all brilliant – the curry was fabulous, the bhajis were crisp and not greasy, and the samosa had a great spicing to the lamb. I really enjoyed my visit there and I can’t wait to get back in the new year to try the other stands. It’s definitely worth a visit and after you’ve had a good fill, you can pop outside and shop for groceries to take home too! Yes, another local to Croydon review! This time it’s the West Croydon branch of Dosa n Chutny, the much beloved restaurant in Tooting. I was keen to see how the Croydon branch compared. I’ll just be upfront and say that service was an utter shambles the Sunday afternoon we visited but luckily the food was excellent. Hopefully the service does improve once the front of house and the cooks all communicate with each other. Anyway, to drink, we ordered Fresh Lemon Juice (£2.25) and Orange + Ginger + Apple Juice (£2.95). Both were excellent but it was the latter that stood out, having a perfect balance of all three ingredients. Not too gingery, not too thin and appley, not tasting just of orange juice. Just perfect. Our food all arrived at once. 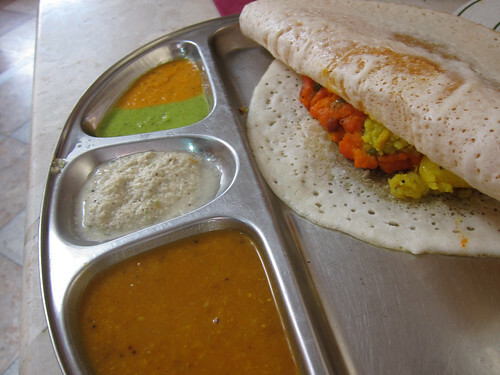 A Special Malasa Dosa (£3.50) turned out to have two kinds of potato mixture in the middle. Apart from the major colour differences, they both tasted pretty similar. The different chutneys were all coconut based and the green and orange ones had a fabulous kick to them. 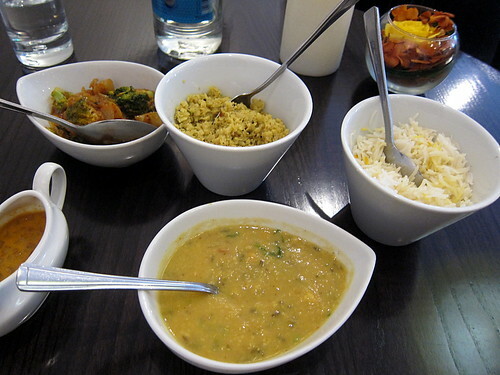 Great sambhar too. 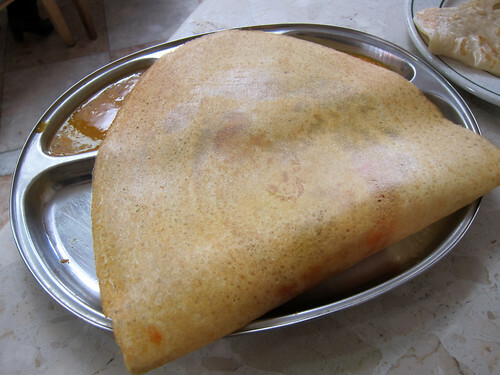 The dosa was both soft and crisp and a most excellent specimen. 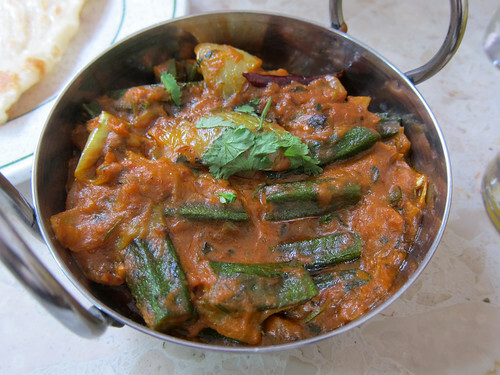 A Bhindi Do Pyaza (£4.75) was well made and helped us with our vegetable content that lunchtime. I can’t resist any good okra dish. We ordered a Veechu Parotha (£1.50) to mop up the gravy and it was a good, tasty, if small, flatbread for it. Despite my seeing our waiter write down our order very very clearly, the kitchen managed to get one of our dishes incorrect (a lot of incorrect orders were also going to other tables that afternoon). There was a bit of a long wait then for our correct order of Paneer Majestic (£4.75). But what arrived was worth the wait! It was indeed majestic! 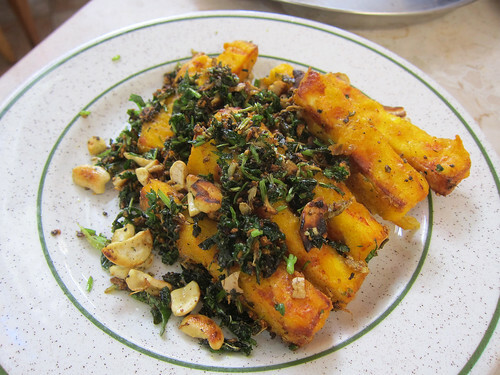 Fingers of paneer were battered and fried and then tossed with a fried mixture of garlic, cashews, spices and …spinach? fenugreek? I’m still not entirely sure what the crispy greens were but the dish was utterly fantastic. After all of that, we decided to order another dosa to help mop up the rest of the bhindi dish. 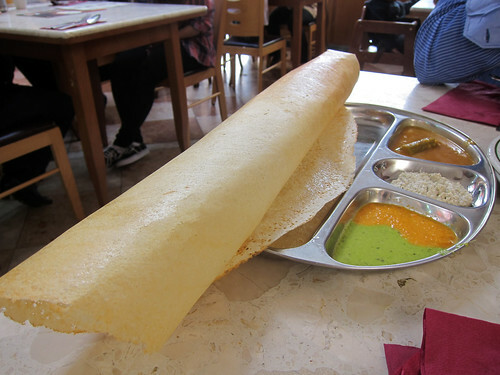 A Paper Roast Dosa (£3.50) came out swiftly – I do love these extra thin, extra crispy dosas and the one at Dosa n Chutny has the added benefit of being very cheap. Oh yeah, the prices are pretty good here, aren’t they? Good stuff. I only wish it was within walking distance of our house! Oh well, the bus ride is ok too. So it turns out there’s a fantastic Malaysian restaurant in Croydon! Well, it’s in Thornton Heath, which is in the London Borough of Croydon and from what I can see, it’s quite the local favourite. Bunga Raya has been open for over 30 years and while the decor does look a bit aged, the food is still alive and kicking. We visited on a Sunday for lunch, when we discovered that they only served a “hawker style” Sunday lunch buffet. Yes, why not? It was only £11.50 a head. Here’s my first plate. Char kway teow, fried meehoon, fish curry, chicken satay and yong tau foo (vegetables and tofu stuffed with meat or fish paste). That chicken satay was excellent, with a brilliant marinade, and you’ll soon see that we went back for seconds and thirds. The meehoon was better than the char kway teow but I think it’s just that meehoon (rice vermicelli) survives under heat lamps a little better. The curries were excellent and there were at least four or five on offer. As we ate, the room kept filling up and many of the diners were Malaysian. Most were families, gathering together for a taste of home. Next plate! 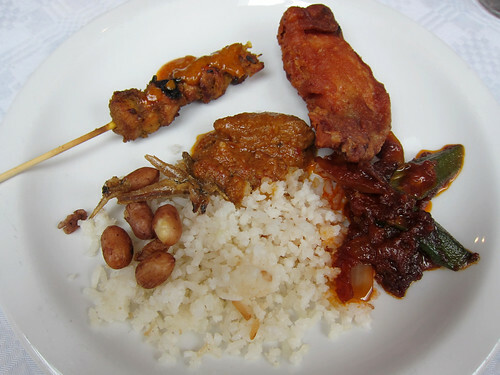 Nasi lemak, chicken rendang, satay again, fried wonton, sambal okra. This plate was all sorts of excellent. The nasi lemak, while the grains of rice were a bit broken, had a good coconut flavour and the sambal okra, not too spicy but with lots of flavour and a touch of sweetness, was probably the best I’ve had in London. Something I need to mention at this point is that everything tasted homemade. That fried wonton was chock full of a well seasoned chicken mixture and everything about it screamed homemade – it was excellent! It felt like eating in a Malaysian family’s home – they even welcomed all their regulars by name. 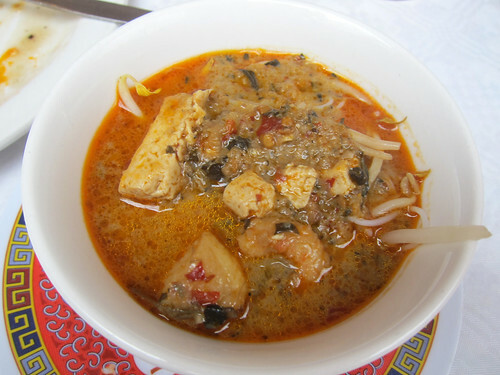 I had a laksa interlude at this point. It was a put-it-together-yourself affair – rice noodles and beansprouts in your bowl and then pour over the rich and creamy soup. Back to the big plates! Satay again (it was excellent! 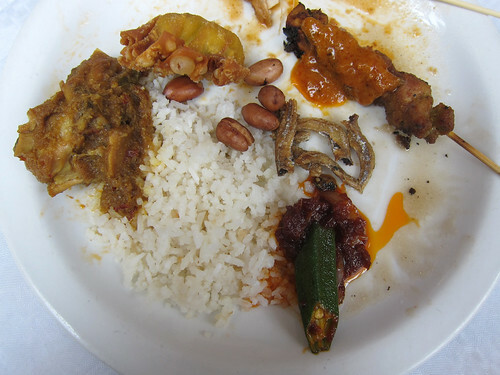 ), more nasi lemak, fried Malaccan chicken wings (I think they’ve got something fishy in the marinade that gave it a deep savouriness), kari kambing and more sambal okra. 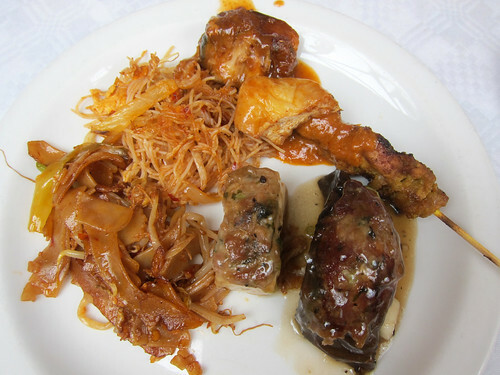 There were lots of savouries I didn’t manage to try – somehow in my sambal okra excitement, I forgot to stop by the pigs trotters, the steamed dumplings and lots of other things too! I was impressed that they even had Penang acar (a pickled vegetable mixture) though, of course, it’s not as good as my mom’s! There were desserts too. In addition to a huge platter of sweet orange wedges, there was a platter of banana puffs (kuih kodok, and they were ok) and a lot of refreshing mango and sago. And a platter of carrot cake as well though its texture and serving style was more reminiscent of a Malaysian cake – so perhaps it’s really a kek carrot? Before we left, I was invited to provide them with my email address so that I can be sent information about further buffets. It turns out that every fortnight, they change what’s on offer – one weekend was Hokkien mee and Hainanese chicken rice, another weekend was asam laksa and won ton mee! I just received the email with highlights of the buffet for the next two Sundays – mee rebus, bak kut teh and gula melaka! Oh yeah, I’ll be back. Often. They do have a regular a la carte menu for most other days – please see their website for their opening hours/days. 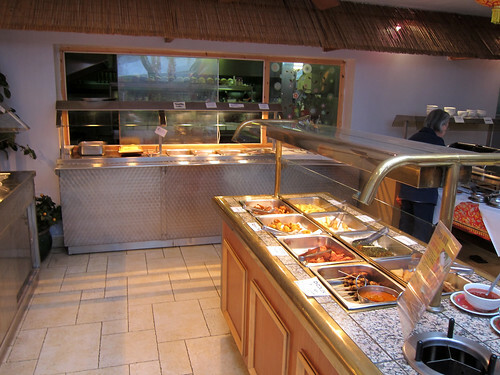 They also advertise buffets on certain nights and also curry and karaoke nights! I suspect my new neighbourhood is full of little gems that need wheedling out. One that never needed any investigation is An Nam, a Vietnamese restaurant in the Wing Yip Centre on the Purley Way. Their chef has won local awards and while it’s not as crowded as Tai Tung (the Cantonese restaurant) at the front of the centre, they more than hold their own. We’re pretty much regulars there now. However, we’ve mainly had their starters and one dish meals – very similar to the casual street food you’d encounter in Vietnam. On our most recent trip, we brought my brother along and he gave the place a hearty thumbs up – the kind of thing I like to hear from someone who did a long work placement in the country! Anyway, we didn’t eat all that you see below on just one visit; this must have been over at least four, I reckon. I love Chả Giò (£4.50) and the version here at An Nam is fantastic. 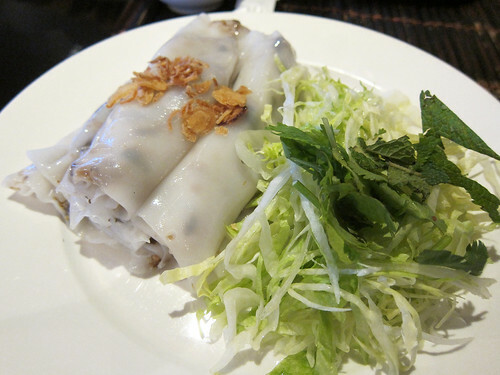 I love the sticky, crispy rice paper wrapped pork rolls and I love that they’re served properly with the lettuce and herbs and pickles, all to wrap around the fried rolls. Gỏi Cuốn Tôm (£4.50) are the fresh summer rolls filled with salad, rice vermicelli and prawns and their rolls are light and not at all stodgy like others I’ve had. 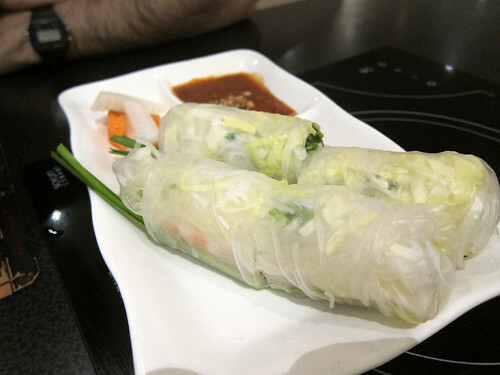 Their Bánh Cuốn Thịt (£4.50) are definitely one of our favourites. These thin rice rolls are filled with seasoned minced pork and mushrooms and are just gorgeous with all those herbs and the usual side of nước chấm. They do have a tendency to slip out between one’s chopsticks though! Bún Chả Giò (£6.50) makes a meal of the chả giò with the addition of the bún (rice vermicelli) and salad and pickles (daikon and carrot). 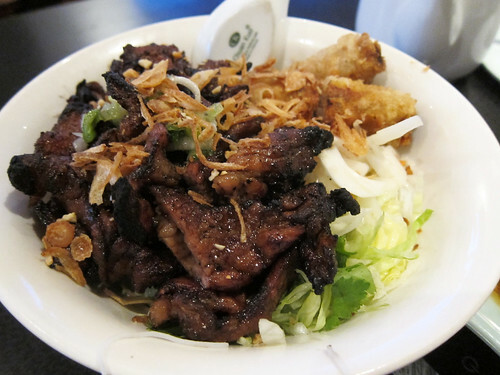 Pour over that nuoc cham and dig in! 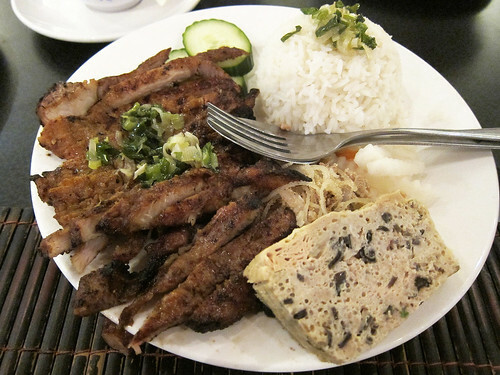 Bún Thịt Heo Nướng (£7) normally has bún but we can substitute rice…which is what we clearly did here. This is accompanied by fabulously delicious grilled marinated pork slices, complete with crispy edges. 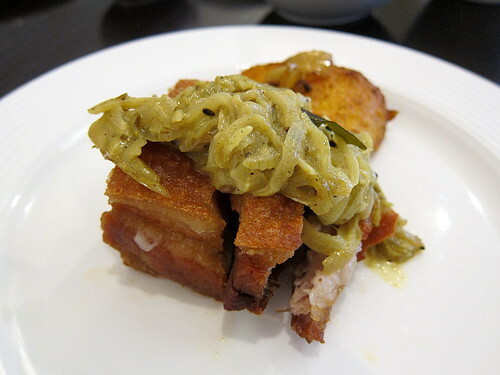 And there’s a generous pile of the thinly sliced, tender pork too. 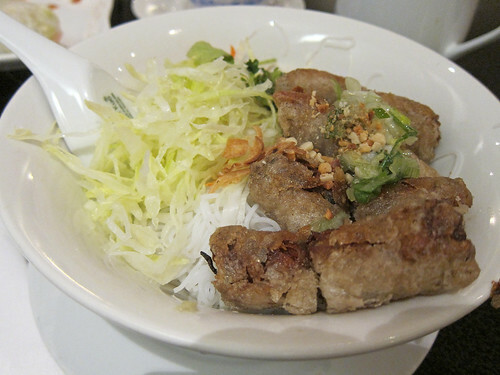 Wait for it…..Bún Thịt Nướng Chả Giò (£7.50)…. 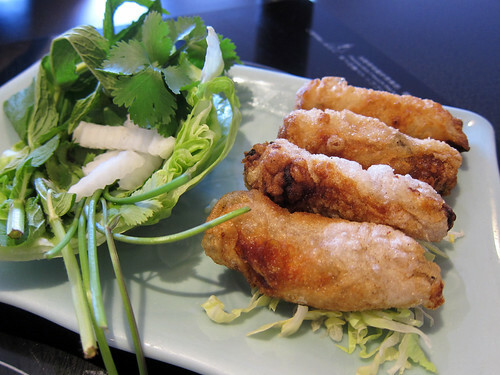 combines the best of both worlds – the grilled pork and the fried rolls. 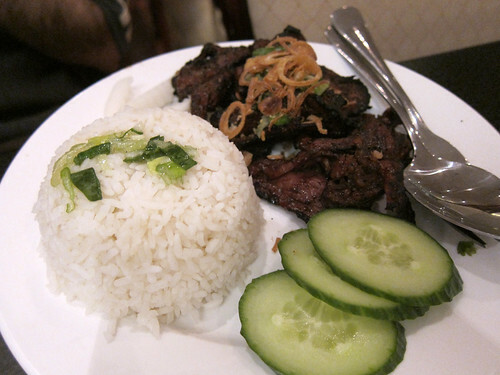 Chả, Bi, Suon Nướng (£7.50) is another rice dish which can also be served with bun. There’s a grilled pork chop (drool, so good), a slice of steamed pork and egg loaf and shredded pork and pig skin; it’s a winning combo. It’s not all just stuff on rice and noodles. They have noodle soups too. 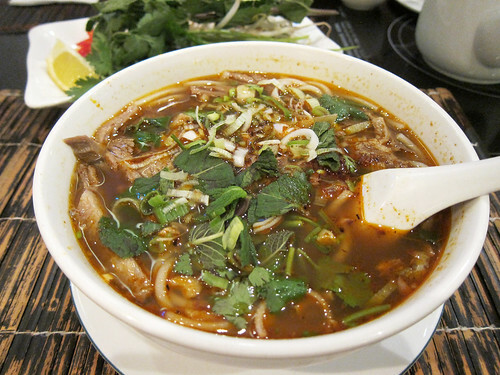 Their Bún Bò Hue (£7) is a spicy bowl full of thick rice noodles and tender stewed beef. This really hit the spot on that cold night when our heating wasn’t working yet! We are going to have to try more of their main dishes soon though. 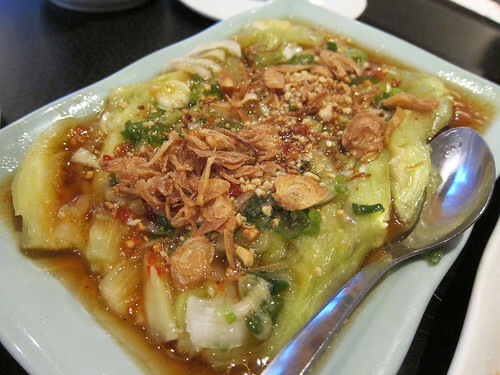 A spicy steamed aubergine we ordered as a side vegetable for dinner one night was brilliant – the soft, silky, steamed aubergine had been sliced and laid flat and then topped with a mixture of soy, garlic, chilli, scallions and fried shallots. 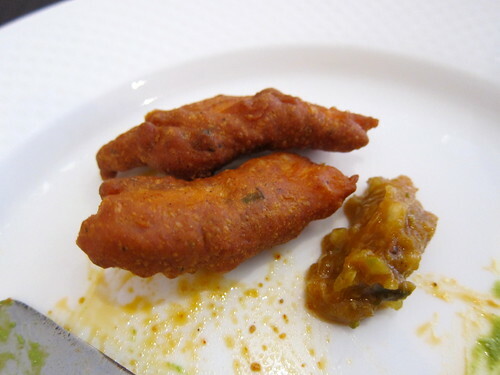 Next on my list to try there (if you can tear me away from any of the bun bowls) is their deep fried fish – I saw a massive platter go by our table one night and it looked fantastic. Their pho is also pretty solid as is their fried rice (why is Vietnamese fried rice always ridiculously good? What secret ingredient do they put in there?!). The only thing that was a dud so far was a random pork udon soup we once ordered but if you stick to the Vietnamese classics (and anything that says it’s their specialty), you won’t go wrong.